Perth: Australia were 132/4 at stumps when umpires decided to call it a day on the third day of second Test being played here at the Optus Stadium here on Sunday. 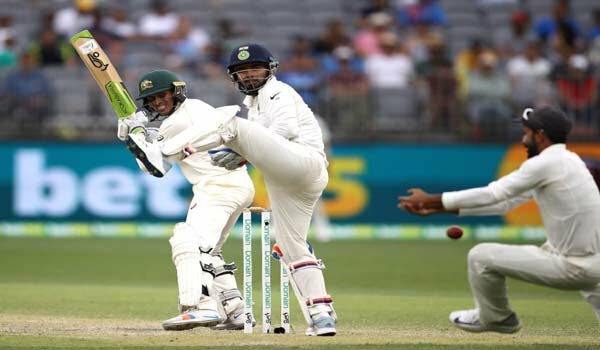 Indian pacers took four wickets in the final session but Australia managed to stretch their lead to 175 at stumps on Day three of the second test. Skipper Tim Paine with 8 runs and Khawaja with 41 runs are at the crease. Australia’s newlook opening partnership of Marcus Harris and Aaron Finch added 112 runs in the first innings of the second Test. The hosts lost its first wicket in the form of Harris for 20. He was bowled by Jasprit Bumrah, while Shaun Marsh was caught by Risabh Pant over Mohammed Shami for 5 runs. P Handscomb was dismissed by Ishant Sharma for 13 runs, while Shami took Head’s wicket reducing Australia for 120/4. Earlier in the day, India bowled out for 283 runs in their first innings giving Australia a lead of 43 runs. Nathan Lyon produced figures of five for 67 as India were bowled out for 283 in the first innings. Skipper Virat Kohli (123) scored a terrific century but the lower middle order disappointed once again as the visitors crumbled in the post-lunch session.